This table is based on group averages. Except for the columns mentioning the frequency of close and zero matches. So for example among my 50 survey participants only one single person received a close African match (>20cM). While two persons did not receive any African matches at all (excl. North Africa). But on average 5 African matches were reported of whom 4 were connected to the Upper Guinea area. (Senegal-Sierra Leone). The average admixture amounts are based on the recently updated Ethnicity Estimates on AncestryDNA. This update strongly reduced the trace regions. Especially for North African & West Asian DNA. For a previous version of this table see this link. The background column is mostly based on informed speculation (plausible surnames/regional admixture) but at times also confirmed by public family trees. The proportion of Upper Guinean related matches is 88% of all African matches (south of the Sahara). That proportion being equal to 227/257. Excluding North African matches from the total. The high number of Fula matches is quite striking. But this could very well reflect a greater popularity of DNA testing among Fula people when compared with people from for example Guiné Bissau who are greatly underrepresented in Ancestry’s customer database. This project was merely intended as an exploratory exercise. Of course my research findings have limitations in several regards. And therefore they should be interpreted carefully in order not to jump to premature or even misleading conclusions. Still I do believe they can reveal relevant tendencies in DNA matching for Cape Verdeans in general. 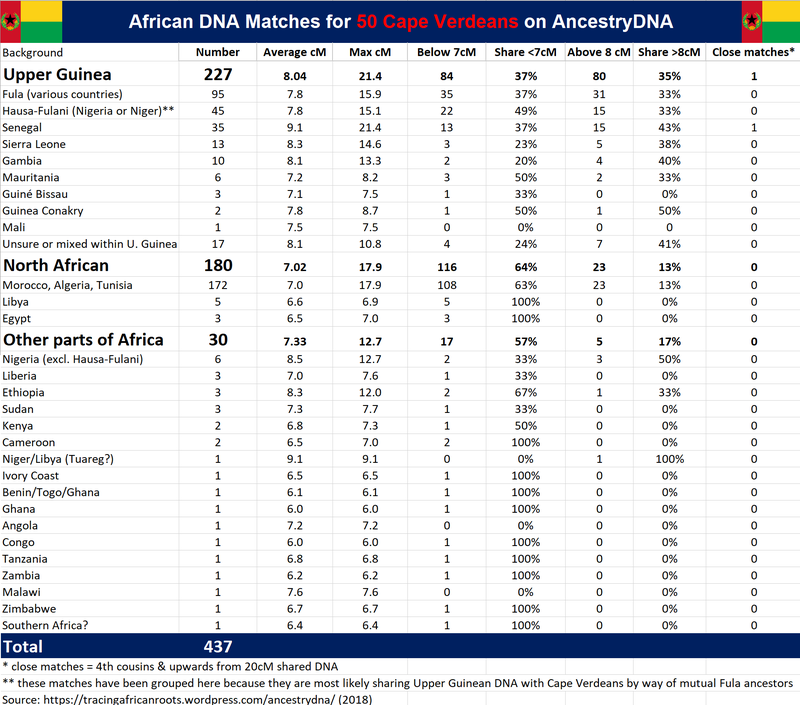 These outcomes may also provide valuable insight into the various ancestral components found within Cape Verdean DNA. In particular when aiming for complementarity by also taking in to account admixture analysis, genealogy and relevant historical context. Upper Guinean matches: as expected African matches (south of Sahara) were overwhelmingly from Upper Guinea (Senegal-Sierra Leone): 88% of the total. In line with the 92% Upper Guinean admixture proportion (“Senegal” + “Mali” / total African) I found for my survey group. Other African matches: unexpected & uncommon. Higher odds of false positives but in some cases to be corroborated by additional clues, such as AncestryDNA’s ethnicity estimates? Methodology: how I filtered the African DNA matches as well as the decision rules I applied when determining a plausible background for each DNA match. Portuguese matches: omnipresent and clearly most numerous as well as often hinting at relatively recent ancestral ties (1800’s-1900’s). Jewish matches: Sephardi matches more likely to be truly genealogical than Ashkenazi matches? West Asian matches: quite rare, possibly indicating that West Asian admixture among Cape Verdeans is generally indicative of actual North African or Sephardi lineage. South Asian matches: also rare, but on a hit and miss basis still sometimes already seemingly validating trace amounts of South Asian admixture. Inter-island matching patterns: illustrated by the distribution of the shared DNA segments between myself and my 100 Cape Verdean survey participants. Methodology: how I filtered the non-African DNA matches as well as the decision rules I applied when determining a plausible background for each DNA match. Dedicated to all my Cape Verdean primos and primas participating in this survey.2 And special dedication to my newly born nephew Max! Click on this banner to reach Cape Verde DNA, Inc: the biggest online community of Cape Verdean Genealogy & DNA enthusiasts! On Augustus 4 & 5 a pioneering Cape Verde DNA and Genealogy Conference will be held! See this link for more details. To be Cape Verdean is to be mixed? Beyond Upper Guinea: valid outcomes or misreading by AncestryDNA? European breakdown reflecting mostly Portuguese ancestry? This frequency of regions being ranked #1 (regions with the highest amount in either the African or European breakdown) is perhaps the best indicator of the main ancestral components for my Cape Verdean survey group. However only in an extra pronounced degree. For more nuance see the group averages in the next sections. More charts and analysis when you continue reading! In the first part of this blogpost i already discussed the main Guinean Bissau origins for Cape Verde according to its 1856 slave census, in this second part i will continue exploring origins outside of Guiné Bissau. When asked about their mainland African roots many Cape Verdeans might assume they only have ancestry coming from Guiné Bissau, this is however not completely true. It’s indeed correct that Guiné Bissau shares a very long and intimate history with Cape Verde. Both countries being ex-Portuguese colonies, united in their independence struggle during the 1970’s. Because of ever increasing English and French encroachment the formal Portuguese influence area within Upper Guinea during the 1600’s was already pretty much confined to modernday Guiné Bissau and Casamance (a region in southern Senegal which only was ceded to the French in 1888 and where a Portuguese-based Creole is still being spoken!). Cape Verde, an independent country since July 5th 1975! Cape Verdeans: an indomitable people for more than 500 years!